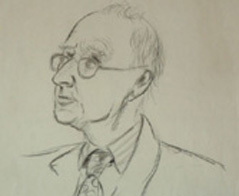 About artist and poet Peter Mark Butler and www.art&verse.com links to online galleries, studios and art and poetry websites. Many of the most important links in our lives go back to the past and especially to our early years. That's why, vital though current and future links are in the Web Community, in my own world of art and verse there can be no more enduring link than that to my long departed friend and mentor, Frederick C. Dickinson. I began painting in my teenage years. My parents ran a guest house in Beltinge on the North Kent coast. Mr Dickinson, as we knew him then, was our neighbour and an artist of some renown. An octogenarian, he sometimes sketched the holiday makers who stayed at our guest house and I tried my hand at sketching alongside him. As a result he offered me personal tuition.To be taught by a Royal Academician is an incredible privilege. Especially by one who, as a young newspaper illustrator, covered Queen Victorias public appearances and court functions in the twilight years of her reign. One memory of my grand old mentor is very special to me. He had me paint an imaginary rural scene of a tumble down haystack in a flooded field. But I couldnt get the hollow in the haystack right. So I took my canvas to him for his advice. In his nineties by now, his deep voice was as resonant as ever and, glancing at my painting, he boomed, Peter! Whats that poached egg doing in the middle of that field? Then he mixed a little burnt umber with alizarin crimson and with a single stroke of his brush, he brought my haystack to life! He urged me never to be pressured into any particular method but always to stick to my own style and vivid use of colours which set me in good stead for turning to art and poetry in earnest in later years. I have no idea what became of Frederick Dickinsons works but fortunately I do have a few of his sketches and scamps, some of them reproduced on this page, including a self portrait. Getting back to the present, I realise that current and future links and friendships are equally important. I am delighted, therefore, to include the following links to art related sites which I fully recommend and to family associated businesses, which obviously I also consider to be highly commendable. Painted By Award winning Artist, Brad T. Enfield. Be sure not to miss out on other sections of the art & verse website. 'Art & Verse' Copyright@2004 Peter M Butler. All rights reserved. Below are four further examples of Frederick Dickinson's work from my small collection of his paintings, sketches, illustrations and scamps. 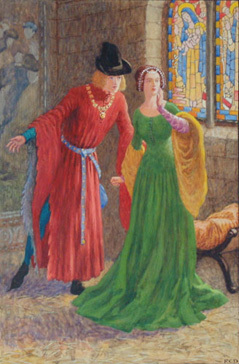 Original illustration of "The Lesters", included in "A Pageant of History", published by Pictorial Education, London, 1932. 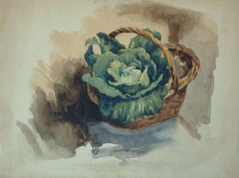 A fresh cut cabbage from the artist's garden at Bergamot, 17 Burlington Drive, Beltinge, Kent. Circa 1950. 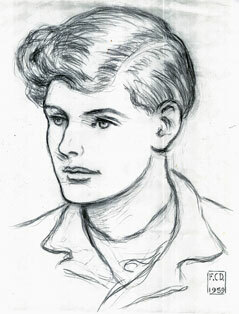 Frederick Dickinson's portrait of yours truly when I was only 16 in 1959. Indeed, a pencil sketch to be treasured. What a contrast to my grim self portrait on the Home Page. 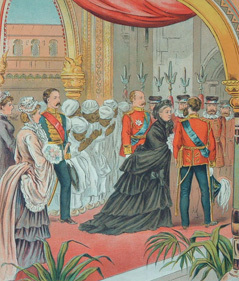 published by Perry & Co Ltd, London, depicting Queen Victoria at the opening of the Indian and Colonial Exhibition, circa 1886. "Your accompanying words, often prescient, add content and an unseen dimension to your paintings." "Good job, I love your poems that go with your paintings. I am impressed. And I love your jazz series, so well done. I look forward to more of your work." "A very kindly lady. Congratulations. It is a very good poem. Don't be sad that your mother is gone. Everybody will go the heaven at last." you've got a talent for capturing people!" Band Leader and Drummer, The Fallen Heroes. God continue to bless you and your very special gift.